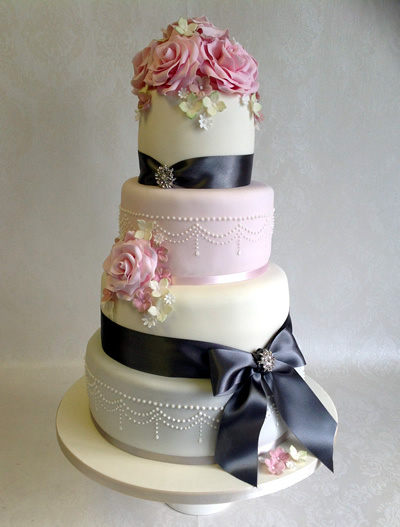 At Celebration Cakes we have a passion for beautiful, bespoke celebration and wedding cakes. We are based in Caversham, near Reading, Berkshire, with a design studio in Moulsford, between Streatley and Wallingford in South Oxfordshire where we have been making beautiful wedding cakes, birthday cakes and special celebration cakes for over 20 years. We design and decorate classic and contemporary wedding cakes, civil partnership cakes and make wedding favours for your wedding day. We specialise in personalised bride and groom toppers and handmade sugar flowers which can echo the flowers in the bride's wedding bouquet. Whether it’s one of our gorgeous chocolate wedding cakes, tiers of personalised wedding cupcake or a 'one-off' unique or novelty wedding cake design, you will receive a professional and friendly service from the design process through to delivery. If you don't see exactly what you would like on the website, please give us a call. If you can imagine it we can probably make it from cake, sugar or chocolate! We make corporate cakes, christening cakes, birthday cakes, children’s cakes and celebration cakes for any occasion. Whether you are looking for an elaborate multi tiered wedding cake or a small celebration cake we can help. Premier Cake Supplier in Berkshire and Oxfordshire. Visit our Ebay shop – everything you need to make fabulous cakes. Consultations by appointment only - please telephone to arrange. We are based in Caversham, Reading in Berkshire, close to Wokingham, Bracknell and Newbury, and in the beautiful South Oxfordshire countryside at Greenlands Farm, Moulsford, between Wallingford and Streatley and not far from Didcot, Abingdon, Maidenhead, Wantage and Henley-on-Thames.